PC/OpenSystems LLC: Today Black Lab Linux 8 "Onyx" is released! Today Black Lab Linux 8 "Onyx" is released! Today PC / Opensystem LLC is pleased to announce its latest release : Black Lab Linux 8 Alpha 1 “Onyx” - our latest FOSS offering. Since this is a consumer-focused release we focused on issues that end-users bring to our attention. First and most important : migration tools, built into the installer, for the growing crowd moving from Windows and Mac OS X, and even other Linux distributions (Ubuntu, Mint) to the unparalleled stability of Black Lab. For that type of migration we now have the Aptik application bundled in;it can help move the most critical system settings from another distribution over to your new BL installation. Next : improved device driver management and a new built-in device driver manager to assist in loading third party binary drivers for proprietary hardware. We didn't neglect eye-candy : new themes and window-borders with bold colors figure prominently;PC / OS is making a statement with its latest release. So what's new with Black Lab Linux 8 “Onyx” Alpha 1? Kernel 3.19.43 – for the RC and the final release, we'll be upgrading to the 4.x / Ubuntu 15.10 “Wily” equivalent kernel. 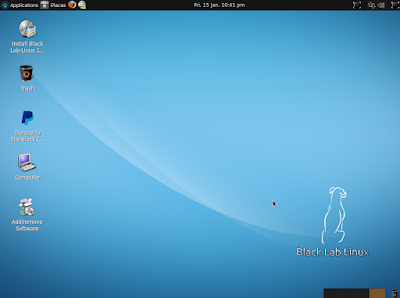 Black Lab Linux 9, the LAST Ubuntu based arm of our distro, will feature the 16.04 LTS kernel. If you would like to contribute documentation, artwork or code please contact PC / OS at support_at_pc-opensystems_dot_com and we will let you know what areas require contributors;if you prefer to contribute funds to sustain your favorite distro, donate through our homepage http://www.blacklablinux.org. For hardware donations, contact support_at_pc-opensystems_dot_com. As always, we thank you for your support!